Have you ever wondered what is like the life of monks? What do they do all day? Why are they here? What do the feel or want or what are they trying to do? Well, this is your chance! 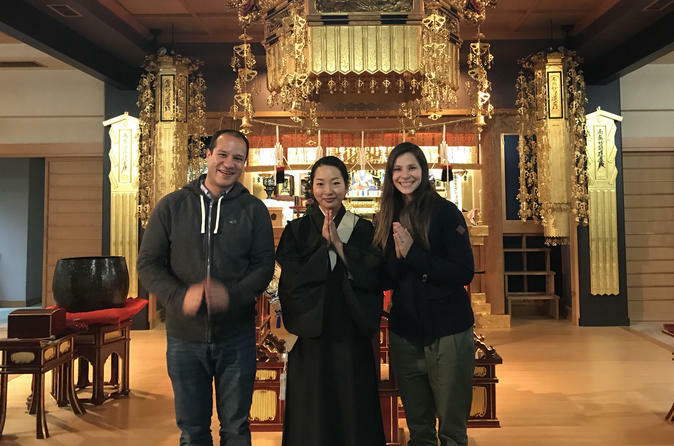 Accompanied by your private interpreter, you will have the unique opportunity to spend a day with a real monk in a real temple and try out his life for a day. Discuss with him all the things you wish and learn the roots of Japanese culture through its most ancient traditions. Choshoji temple is located close to Asakusa station where many traditions and historical sites remain present today. Through this 3-hour trip, you will not only explore the temple but also experience a day with monks. "Hi everyone, I am Komiya from the Enichizan Choushou temple. Choushou temple was built in Kamakura period which is about 800 years ago.When you come to the Choushou temple, you can leave your worry and anxiety and enjoy the quiet, peaceful and solemn atmosphere while walking around the temple. I am the person in charge of the introduction. As a female abbot, I can guide and introduce the works and the temple in a different aspect. I am very much looking forward to meeting you all"
First, we will discover the temple and all its symbolism, history and details, Thanks to your personal interpreter, you'll be able to ask all the questions you wish to deepen your knowledge of Buddhism while being able to hold and examine all the relics usually forbidden to common folks. Then, you will be invited to partake to the monks regular activities and to share their way of life for a little while. Finally, together with the monks you will learn how to chant the Japanese Buddhism Sutra and enjoy the hypnotic effect of it. An interpreter will be with you at all times.